For other people named Robert Rodriguez, see Robert Rodriguez (disambiguation). Robert Anthony Rodriguez (/rɒˈdriːɡɛz/; born June 20, 1968) is an American filmmaker. He shoots, edits, produces, and scores many of his films in Mexico and his home state, Texas. Rodriguez directed the 1992 action film El Mariachi, which was a commercial success after grossing $2 million against a budget of $7,000. The film spawned two sequels known collectively as the Mexico Trilogy: Desperado and Once Upon a Time in Mexico. He directed From Dusk Till Dawn in 1996 and developed its television adaptation series (2014–2016). Rodriguez co-directed the 2005 neo-noir crime thriller anthology Sin City (adapted from the graphic novel of the same name) and the 2014 sequel, Sin City: A Dame to Kill For. Rodriguez also directed the Spy Kids films, The Faculty, The Adventures of Sharkboy and Lavagirl, Planet Terror, Machete, and Alita: Battle Angel. He is a friend and frequent collaborator of filmmaker Quentin Tarantino, who founded the production company A Band Apart, of which Rodriguez was a member. In December 2013, Rodriguez launched his own cable television channel, El Rey. Rodríguez was born in San Antonio, Texas, the son of Mexican parents Rebecca (née Villegas), a nurse, and Cecilio G. Rodríguez, a salesman. He began his interest in film at age eleven, when his father bought one of the first VCRs, which came with a camera. While attending St. Anthony High School Seminary in San Antonio, Rodríguez was commissioned to videotape the school's football games. According to his sister, he was fired soon afterward as he had shot footage in a cinematic style, getting shots of parents' reactions and the ball traveling through the air instead of shooting the whole play. In high school, he met Carlos Gallardo; they both shot films on video throughout high school and college. Rodriguez went to the College of Communication at the University of Texas at Austin, where he also developed a love of cartooning. Not having grades high enough to be accepted into the school's film program, he created a daily comic strip entitled Los Hooligans. Many of the characters were based on his siblings – in particular, one of his sisters, Maricarmen. The comic ran for three years in the student newspaper The Daily Texan, while Rodríguez continued to make short films. Rodríguez shot action and horror short films on video and edited on two VCRs. In late 1990, his entry in a local film contest earned him a spot in the university's film program. There he made the award-winning 16 mm short Bedhead (1991). The film chronicles the amusing misadventures of a young girl whose older brother sports an incredibly tangled mess of hair which she detests. Even at this early stage, Rodríguez's trademark style began to emerge: quick cuts, intense zooms, and fast camera movements deployed with a sense of humor. Bedhead (1991) was recognized for excellence in the Black Maria Film Festival. It was selected by Film/Video Curator Sally Berger for the Black Maria 20th-anniversary retrospective at MoMA in 2006. The short film "Bedhead" attracted enough attention to encourage him to seriously attempt a career as a filmmaker. He went on to shoot the action flick El Mariachi (1992) in Spanish; he shot it for around $7,000 with money raised by his friend Adrian Kano and from payments for his own participation in medical testing studies. Rodriguez won the Audience Award for this film at the Sundance Film Festival in 1993. Intended for the Spanish-language low-budget home-video market, the film was "cleaned up" by Columbia Pictures with post-production work costing several hundred thousand dollars before it was distributed in the United States. Its promotion still advertised it as "the movie made for $7,000". Rodríguez described his experiences making the film in his book Rebel Without a Crew (1995). Desperado was a sequel to El Mariachi that starred Antonio Banderas and introduced Salma Hayek to American audiences. Rodríguez went on to collaborate with Quentin Tarantino on the vampire thriller From Dusk till Dawn (also both co-producing its two sequels), and he wrote, directed, and produced the TV series for his own cable network, El Rey. Rodriguez has also worked with Kevin Williamson, on the horror film The Faculty. In 2001, Rodríguez enjoyed his first Hollywood hit with Spy Kids, which went on to become a movie franchise. A third "mariachi" film also appeared in late 2003, Once Upon a Time in Mexico, which completed the Mexico Trilogy (also called the Mariachi Trilogy). He operates a production company called Troublemaker Studios, formerly Los Hooligans Productions. Rodríguez co-directed Sin City (2005), an adaptation of the Frank Miller Sin City comic books; Quentin Tarantino guest-directed a scene. During production in 2004, Rodríguez insisted Miller to be credited as co-director, because he considered the visual style of Miller's comic art to be just as important as his own in the film. However, the Directors Guild of America would not allow it, citing that only "legitimate teams", e.g., the Wachowskis, could share the director's credit. Rodríguez chose to resign from the DGA, stating, "It was easier for me to quietly resign before shooting because otherwise I'd be forced to make compromises I was unwilling to make or set a precedent that might hurt the guild later on." By resigning from the DGA, Rodríguez was forced to relinquish his director's seat on the film John Carter of Mars for Paramount Pictures. Rodríguez had already signed on and had been announced as director of that film, planning to begin filming soon after completing Sin City. Sin City was a critical hit in 2005 as well as a box office success, particularly for a hyperviolent comic book adaptation that did not have name recognition comparable to the X-Men or Spider-Man. He has an interest in adapting all of Miller's Sin City comic books. Rodríguez released The Adventures of Sharkboy and Lavagirl in 2005, a superhero-kid movie intended for the same younger audiences as his Spy Kids series. Sharkboy and Lavagirl was based on a story conceived by Rodríguez's 7-year-old son, Racer, who was given credit for the screenplay. The film grossed $39 million at the box office. Rodríguez wrote and directed the film Planet Terror as part of the double-bill release Grindhouse (2007). Quentin Tarantino directed Grindhouse's other film. He has a series of "Ten Minute Film School" segments on several of his DVD releases, showing aspiring filmmakers how to make good, profitable movies using inexpensive tactics. Starting with the Once Upon a Time in Mexico DVD, Rodríguez began creating a series called, "Ten Minute Cooking School" where he revealed his recipe for "Puerco Pibil" (based on Cochinita pibil, an old dish from Yucatán), the same food Johnny Depp's character, "Agent Sands" ate in the film. The popularity of this series led to the inclusion of another "Cooking School" on the two-disc version of the Sin City DVD where Rodríguez teaches the viewer how to make "Sin City Breakfast Tacos", a dish (made for his cast and crew during late-night shoots and editing sessions) utilizing his grandmother's tortilla recipe and different egg mixes for the filling. He had initially planned to release a third "Cooking School" with the DVD release of Planet Terror but then announced on the "Film School" segment of the DVD that he would put it on the Grindhouse DVD set instead. The Cooking School, titled "Texas Barbecue...from the GRAVE! ", is a dish based on the "secret barbecue recipe" of JT Hague, Jeff Fahey's character in the film. Rodríguez is a strong supporter of digital filmmaking, having been introduced to the practice by director George Lucas, who personally invited Rodríguez to use the digital cameras at Lucas's headquarters. He was presented with the Extraordinary Contribution to Filmmaking Award at the 2010 Austin Film Festival. On February 7, 2010, it was announced that Rodríguez would produce a new Predator sequel, entitled Predators. This film's script was based on early drafts he had written after seeing the original. Rodriguez's ideas included a planet-sized game preserve and various creatures used by the Predators to hunt a group of abducted yet skilled humans. Opening to mostly positive reviews, the film fared reasonably well at the box office. Machete is a feature film directed by Rodríguez and released in September 2010. It is an expansion of a fake trailer Rodriguez directed for the 2007 film Grindhouse. It starred Danny Trejo as the title character. Trejo, Rodriguez's 2nd cousin, has worked with him in some of his other movies such as Desperado, From Dusk Till Dawn, Once Upon a Time in Mexico and Spy Kids, where Trejo first appeared as Machete. Although originally announced to be released direct-to-DVD as an extra on the Planet Terror DVD, the film was produced as a theatrical release. According to Rodríguez, the origins of the film go back to Desperado. He says, "When I met Danny, I said, 'This guy should be like the Mexican Jean-Claude Van Damme or Charles Bronson, putting out a movie every year and his name should be Machete.' So I decided to do that way back when, never got around to it until finally now. So now, of course, I want to keep going and do a feature." In an interview with Rolling Stone magazine, Rodriguez said that he wrote the screenplay back in 1993 when he cast Trejo in Desperado. "So I wrote him this idea of a federale from Mexico who gets hired to do hatchet jobs in the U.S. I had heard sometimes FBI or DEA have a really tough job that they don't want to get their own agents killed on, they'll hire an agent from Mexico to come do the job for $25,000. I thought, "That's Machete. He would come and do a really dangerous job for a lot of money to him but for everyone else over here it's peanuts." But I never got around to making it." Rodríguez hoped to film Machete at the same time as Sin City: A Dame to Kill For. Additionally, during Comic-Con International 2008, he took the time to speak about Machete, including such topics as: status, possible sequels after the release of Machete, and production priorities. It was also revealed that he has regularly pulled sequences from it for his other productions including Once Upon a Time in Mexico. Machete was released in theaters September 3, 2010 in the U.S.A.
On May 5, 2010, Robert Rodríguez responded to Arizona's controversial immigration law by releasing an "illegal" trailer on Ain't It Cool News. The fake trailer combined elements of the Machete trailer that appeared in Grindhouse with footage from the actual film, and implied that the film would be about Machete leading a revolt against anti-immigration politicians and border vigilantes. Several movie websites, including Internet Movie Database, reported that it was the official teaser for the film. However, Rodriguez later revealed the trailer to be a joke, explaining "it was Cinco de Mayo and I had too much tequila." Since 1998, he has owned the film rights to Mike Allred's off-beat comic Madman. The two have hinted at the project being close to beginning on several occasions without anything coming of it. However, other projects have been completed first (Allred was instrumental in connecting Rodríguez with Frank Miller, leading to the production of Sin City). In 2004, Allred, while promoting his comic book, The Golden Plates, announced that a screenplay by George Huang was near completion. In March 2006, it was announced that production on Sin City: A Dame to Kill For would be postponed. Allred announced at the 2006 WonderCon that production would likely commence on Madman the Movie in 2006. Huang is actually friends with Rodriguez, who advised him to pursue filmmaking as a career when Rodriguez landed a deal with Columbia Pictures where Huang was an employee. In May 2007, it was announced that Rodríguez had signed on to direct a remake of Barbarella for a 2008 release. At the 2007 Comic-Con convention, actress Rosario Dawson announced that because of Barbarella, production of Sin City: A Dame to Kill For would be put on hold. She also announced that she would be playing an amazon in the Barbarella film. As of June 2008, plans to remake the film Barbarella with Rose McGowan as the lead have been delayed; the actress and director are instead remaking the film Red Sonja. In May 2008, Rodríguez is said to be shopping around a prison drama television series called Woman in Chains!, with Rose McGowan being a possibility for a lead role. As of May 2009, Rodríguez planned to produce a live-action remake of Fire and Ice, a 1983 film collaboration between painter Frank Frazetta and animator Ralph Bakshi. The deal was closed shortly after Frazetta's death. 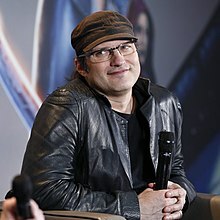 In 2011, Rodríguez announced at Comic-Con that he had purchased the film rights to Heavy Metal and planned to develop a new animated film at the new Quick Draw Studios. In November 2015, it was announced Rodriguez directed the film 100 Years, which would not be released until 2115. In March 2017, it was announced that Rodriguez would direct Escape from New York, a remake of the dystopian sci-fi action film with original director John Carpenter producing. Rodríguez announced in April 2006 that he and his wife Elizabeth Avellán, with whom he had five children (Rocket, Racer, Rebel, Rogue and Rhiannon), had separated after 16 years of marriage. Avellán has continued to produce most of his films since the split-up, so their professional relationship has continued. He reportedly had a "dalliance" with actress Rose McGowan during the shooting of Grindhouse. In October 2007, Elle Magazine revealed that Rodríguez had cast McGowan in the title role in his remake of Barbarella. After some reports of their breaking up and being together again, they split up in October 2009. In October 2010, he walked Alexa Vega (Carmen Cortez in Spy Kids series) down the aisle at her wedding to producer Sean Covel. In March 2014, Rodriguez showed his collection of Frank Frazetta original paintings in Austin, Texas, during the SXSW festival. Rodríguez not only has the credits of producing, directing and writing his films, he also frequently serves as editor, director of photography, camera operator, steadicam operator, composer, production designer, visual effects supervisor, and sound editor on his films. This has earned him the nickname of "the one-man film crew". He abbreviates his numerous roles in his film credits; Once Upon a Time in Mexico, for instance, is "shot, chopped, and scored by Robert Rodriguez", and Sin City is "shot and cut by Robert Rodriguez". He calls his style of making movies "Mariachi-style" (in reference to his first feature film El Mariachi) in which (according to the back cover of his book Rebel Without a Crew) "Creativity, not money, is used to solve problems." In his book The DV Rebel's Guide, Stu Maschwitz coined the term "Robert Rodriguez list", i.e. the filmmaker compiling a list of things they have access to like cool cars, apartments, horses, samurai swords and so on, and then writing the screenplay based on that list. ^ "Monitor". Entertainment Weekly (1264). June 21, 2013. p. 26. ^ Booth Thomas, Cathy (August 13, 2005). "Robert Rodriguez – TIME". TIME. Retrieved April 24, 2009. ^ The Deadline Team. "El Rey's 'From Dusk Till Dawn' Rounds Out Cast, by THE DEADLINE TEAM". Deadline. Retrieved November 16, 2014. ^ Craig Hunter. "T2's Robert Patrick & More Join 'From Dusk Till Dawn: The Series'". Thehollywoodnews.com. Retrieved November 16, 2014. ^ "Robert Rodriguez Biography (1968?-)". Filmreference.com. Retrieved April 24, 2009. ^ Marvis, Barbara J. (1998). 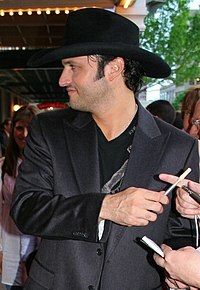 Robert Rodriguez. Mitchell Lane. p. 5. ISBN 1883845483. ^ "Bedhead (1991)". Brian's Robert Rodriguez Page (Geocities). Archived from the original on October 25, 2009. Retrieved August 16, 2007. ^ A FILM FOR A SONG: Robert Rodriguez’s Garage Movie. ^ Shone, Tom (November 25, 2009). "Paranormal Activity and the myth of the shoestring shocker". The Guardian. London. Retrieved May 1, 2010. ^ Robert Rodriguez (1995). Rebel Without a Crew. New York: Dutton Books, Plume. pp. 6–11. OCLC 155845528. Retrieved June 13, 2012. ^ Strom, Heidi (September 1, 1995). "`Desperado' Burns Up Screen". Daily Press. Retrieved February 4, 2015. ^ McCarthy, Todd (May 25, 1995). "Review: 'Desperado'". Variety. Retrieved February 4, 2015. ^ The Deadline Team. "El Rey's 'From Dusk Till Dawn' Rounds Out Cast". Deadline. Retrieved November 16, 2014. ^ Goldstein, Patrick. "The Faculty". LA Times. Retrieved September 29, 2012. ^ "The Robert Rodriguez Archives". ^ Hughes, David (2008). The Greatest Science Fiction Movies Never Made. Titan Books. pp. 311–22. ISBN 978-1-84576-755-6. ^ McWeeny, Drew (March 2, 2004). "Holy Crap!! Rodriguez Just Can't Stop!! First SIN CITY, And Now ... PRINCESS OF MARS!!!". Ain't It Cool News. Retrieved December 26, 2011. ^ "Robert Rodriguez Is Walking Alexa Vega Down the Aisle". LATINA. Retrieved December 6, 2017. ^ "The Numbers: Where Data and the Movies Meet". ^ "Grindhouse DVD Details Revealed". /Film. ^ Morris, Clint (May 14, 2007). "Machete movie greenlit!". Moviehole. Archived from the original on October 11, 2007. Retrieved November 17, 2007. ^ Moro, Eric (March 11, 2007). "SXSW 07: Machete Movie Coming". IGN Film Force. Retrieved March 27, 2007. ^ Edwards, Gavin (April 2007). "Horror Film Directors Dish About Grindhouse Trailers". Rolling Stone. Retrieved April 4, 2007. ^ Sciretta, Peter (March 26, 2007). "Rodriguez to film Machete Movie during Sin City 2". /film. Archived from the original on |archive-url= requires |archive-date= (help). Retrieved May 9, 2008. ^ "COMIC CON 2008: Robert Rodriguez talks Machete". YouTube. July 24, 2008. Retrieved April 24, 2009. ^ "Machete Movie Trailer Takes a Smart Slash at Arizona Immigration Law". dailyfinance.com. Retrieved May 8, 2010. ^ a b c d e Knowles, Harry (May 19, 2010). "A family friendly Machete? What do you mean no race war? & A secret Frazetta project?? Exclusive Robert Rodriguez interview!!". Ain't It Cool News. Retrieved May 20, 2010. ^ "Rodriguez to direct 'Barbarella'". Hollywoodreporter.com. May 22, 2007. Archived from the original on October 11, 2007. Retrieved April 24, 2009. ^ "G4 – The Feed – Dawson Talks 'Occult' on Comic-Con LIVE". G4tv.com. July 24, 2007. Retrieved April 24, 2009. ^ "Rodriguez and McGowan Team for Red Sonja – Superhero Hype!". Superhero Hype!. Retrieved April 24, 2009. ^ "shopping around Woman in Chains!". Collider.com. May 28, 2008. Retrieved April 24, 2009. ^ Film School Rejects (July 21, 2011). "SDCC: Robert Rodriguez Takes Heavy Metal". comingsoon.net. Retrieved November 26, 2011. ^ Bryant, Jacob (November 19, 2015). "John Malkovich and Robert Rodriguez Made a Movie That Won't Release Until 2115". Variety. ^ Jr, Mike Fleming (March 24, 2017). "Robert Rodriguez To Direct 'Escape From New York'". ^ "Daily Dish: Rodríguez Splits With Wife". SFGate. April 7, 2006. Retrieved April 24, 2009. ^ Wells, Jeffrey. "Hollywood Elsewhere". Hollywood Everywhere. Archived from the original on January 4, 2008. ^ "Weinsteins ready for 'Grindhouse' – Entertainment News, Anne Thompson, Media". Variety. March 30, 2007. Retrieved April 24, 2009. ^ "Elle Tell All: September 30, 2007". Fashion.elle.com. September 30, 2007. Archived from the original on August 13, 2010. Retrieved April 24, 2009. ^ "Rose McGowan Dumps Robert Rodriguez". New York Post. Archived from the original on March 27, 2009. ^ Jordan, Julie (July 2, 2008). "Rep: Rose McGowan & Robert Rodriguez Projects Still on Track - Couples, Robert Rodriguez, Rose McGowan". People. Retrieved April 24, 2009. ^ "Rose McGowan is single again". Straits Times. Archived from the original on March 3, 2010. ^ "Alexa Vega of Spy Kids Marries Producer". People. October 11, 2010. ^ Casey, Dan (March 6, 2014). "Exclusive: Robert Rodriguez Opening Museum of Frank Frazetta Art at SXSW". Nerdist. Retrieved December 24, 2015. ^ a b Maschwitz, Stu (2007). The DV rebel's guide : an all-digital approach to making killer action movies on the cheap. Berkeley, CA: Peachpit Press. p. back cover. ISBN 978-0321413642. 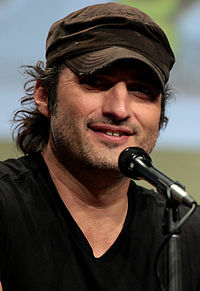 Wikimedia Commons has media related to Robert Rodriguez.